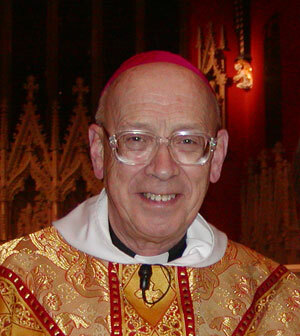 Bishop Ambrose, Bishop Emeritus of Hexham and Newcastle, died on Tuesday 14 June 2011. Requiescat in pace. He was Bishop of Hexham and Newcastle from 1992 to 2004. Michael Griffiths was born in London on 4th December 1928, to Hilda and Henry Griffiths. He attended a prep School in Brighton and then moved north to attend the Ampleforth Preparatory School at Gilling Castle in North Yorkshire and from there moved to Ampleforth School for his secondary education. In 1946 he won a place at Balliol College in Oxford where he obtained a First Class BSc Honours Degree in Natural Sciences, majoring in Chemistry. Seven years later he obtained his MA. On 24th September 1950, after completing his studies at Oxford, he joined the Benedictine Community at Ampleforth Abbey and was given the religious name Ambrose (after the saint who was Bishop of Milan in the fourth century). He was sent to the Benedictine House of Sant’ Anselmo in Rome where he studied Theology and was ordained Priest on 21st July 1957. He taught Science, RE and woodwork at Ampleforth from 1958 - 1972, and became Head of the Science Department at the School. From 1963 – 1971 he also taught dogmatic theology to the young monks of the community. In 1972 he was appointed as Procurator (Bursar) of the Abbey and was responsible for the day to day running, and the financial matters of the Abbey. In 1976 he was appointed Abbot of the Abbey by the Community and was in charge of Ampleforth for eight years until he was appointed as Parish priest of St. Mary’s Parish in Leyland, Lancashire. As parish priest he was involved in all the usual day to day activities and societies of normal parish life. As Parish Priest of Leyland he also had the title of Abbot of Westminster, a title he was given when he was not re-elected as Abbot of Ampleforth. On 11th January 1992, Pope John Paul II announced that he had appointed the Rt. Rev. Ambrose Griffiths OSB (Order of St. Benedict) as the 11th Bishop of Hexham and Newcastle to succeed the Rt. Rev. Bishop Hugh Lindsay who had tendered his resignation as Bishop of the Diocese on the grounds of ill health. 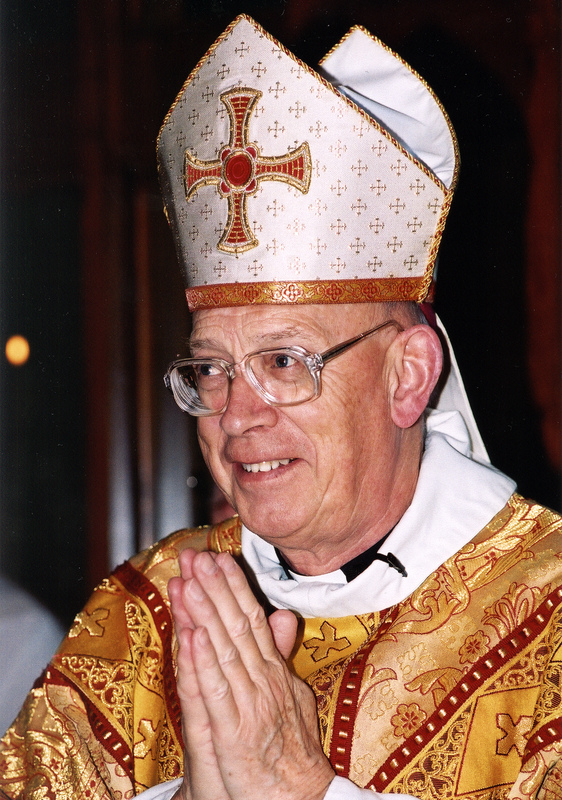 On 20th March 1992, Ambrose Griffiths was Ordained as Bishop by the Archbishop of Liverpool, the Most Reverend Derek Worlock in St. Mary’s Cathedal, Newcastle upon Tyne. Ambrose Griffiths was installed as Bishop of the Diocese in front of the priests and people of the Diocese, many Bishops of England and Wales, including Cardinal Basil Hume, the Archbishop of Westminster, the Abbot of Ampleforth prior to Ambrose Griffiths. 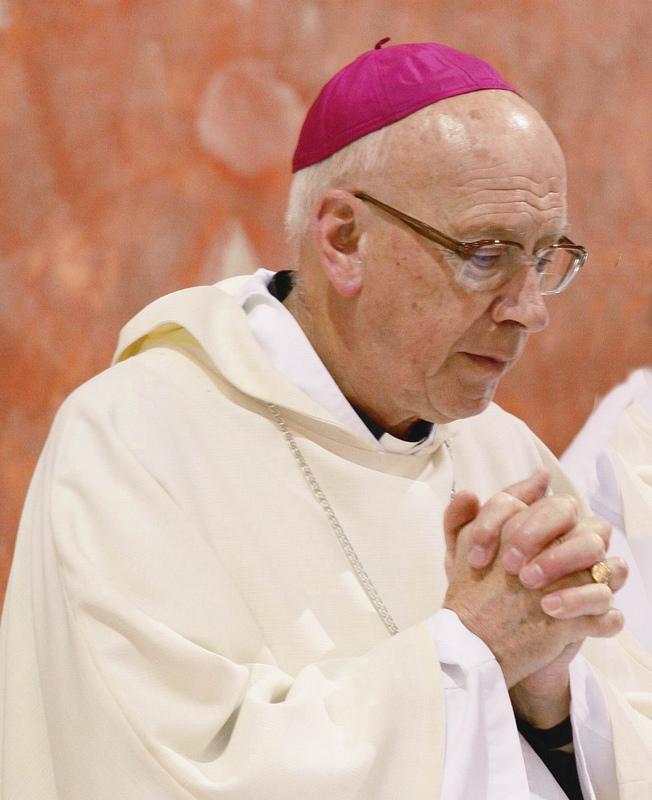 Bishop Ambrose tendered his resignation at the age of 75 to Pope John Paul II, a requirement necessary for all bishops. He was succeeded by Bishop Kevin Dunn. 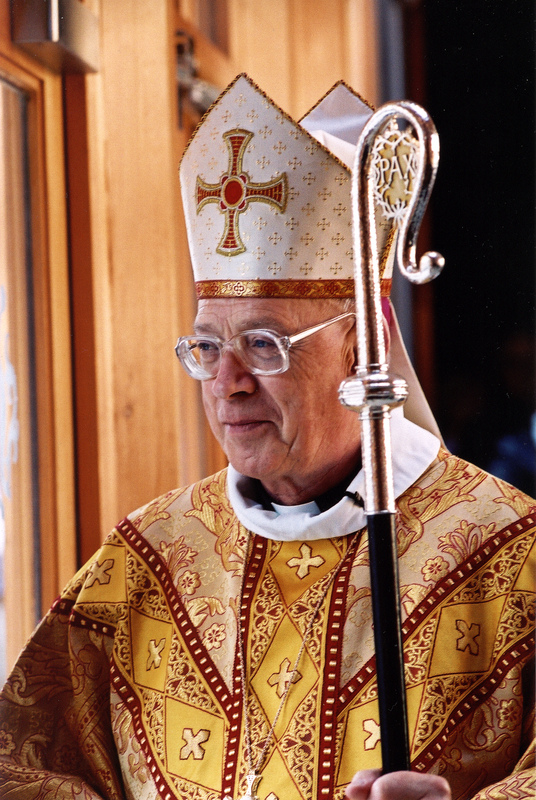 Bishop Ambrose died peacefully on 14th June following a serious illness due to acute leukaemia. He was 82. Click on each image above to enlarge. A Funeral Requiem for Bishop Ambrose took place at St. Mary's Cathedral on 1st July 2011. The Cathedral was filled to overflowing as many hundreds of people from our Diocese and nationally came to pay their last respects to a well loved Bishop. Bishop Ambrose's relatives, civic leaders and dignitaries, nine Bishops, two Abbots, and over one hundred priests and deacons were among the guests, who also included several ecumenical and interfaith representatives. The principal celebrant, Bishop Séamus Cunningham, was joined by Archbishop Vincent Nichols, Archbishop of Westminster, and His Excellency Archbishop Antonio Mennini, the Apostolic Nuncio and many other bishops and priests. Following the Final Commendation the body of Bishop Ambrose was taken to Ampleforth Abbey, for burial in the vault under the Abbey church.